Capsiplex is a weight loss pill that supposedly uses the slimming power of red peppers to get your body to drop the pounds. In several places around the globe they call peppers capsicum which is where it gets its name from. Not the ones that look like green peppers but red, in this case they are referring to hot red peppers, like chili peppers. Most people that are trying to sell it claim that there are a lot of benefits to red peppers, but is there any validity to this, and do they really work at helping you lose weight? In the world of diet and weight loss pills, it seems anything is fair game to use as long as you can convince someone that it’s plausible. All fruits and vegetables will eventually get their moment in the sun as the next big thing in weight loss. Now it’s red peppers they are saying have 30 years of research behind them as being a fat loss aid. They claim you can burn 12 times more calories than you do normally. They also say that you’ll burn three times more calories if you take it before you do an exercise routine. They claim that this totals 278 more calories burned by using it in conjunction with working out. They go on to state that you could lose up to 4 pounds by using it for one week, and then lose a pound or two per week ongoing. The makers of Capsiplex claim that they sold out in just three days, but luckily the product is back in stock. Whether you believe this or not is up to you, but it seems like a pretty obvious marketing ploy designed to create a sense of urgency in the buyer. The hype comes from this being a diet pill, and all diet pills having the hype of not having to change your current lifestyle and still eating the foods you want and being as lazy as you want but still losing weight. Capsiplex not only doesn’t recommend exercising along with taking it, they use exercising as a way to push the use of it, by asking you if you’d rather spend 40 minutes on a bicycle, or take a pill. 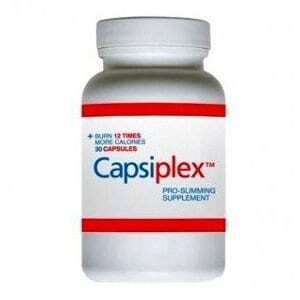 A one month supply of Capsiplex is $50, but they have several different offers that allow you to get the per bottle price down, if you order in bulk. Using their best offer you could get it down to $35 a bottle, which is their buy 5 get 2 free offer. This is where they make their strongest claim, saying that you’ll automatically burn the calories just by taking the pill and you won’t have to change what you’re eating or do any exercise to get the benefits. It’s a common draw to these sort of diet pills, and what initially attracts dieters to them. After struggling in the gym, watching what you eat, and not getting the results that you want, or as quickly as you want, you might be very tempted to start using something like this. But no matter if you buy this or not, it’s always a good idea to make positive changes in your life, and keep a healthy lifestyle. This includes eating foods that are wholesome and nutritious, and getting up and moving on a regular basis. If you decide to take Capsiplex, it’s recommended to also eat right and exercise regularly so that you get the best results. You’ll have a hard time finding an objective review on this, because almost every site out there that says it’s reviewing the product is actually selling the product. Therefore, they’ll just talk about how great it is in hopes that you click through and make a purchase. There are plenty of sites that say “Don’t buy Capsiplex until you read this!” but then go on to tout its benefits. We’re one of the few that actually tell you not to buy it, even after you read this. Celebrity endorsements are worthless, and so are any testimonials you’ll find on their official site. Celebrities get paid to use products, and half the time they don’t even use them, they just get paid to make a statement or to record a sound byte. Testimonials are always glowing, and that’s why they’re called testimonials and not reviews. Getting to the real reviews by actual users is hard, in fact there isn’t really enough out there to be statistically significant. The few reports that are available are mixed, and inconclusive. Capsiplex can most likely be avoided, but you can give it a shot if you think that it will help you in your personal situation. There’s just not a lot of hard evidence we could find that makes us believe it works, and their “clinical study” just doesn’t have enough backing to it for us to get behind this one. However, we open up the discussion below for those that have tried it to sound off on their results. You can try Capsiplex, but be aware that there’s no way to know whether or not it will work for you. Our guess is that it probably won’t, and you should hold off on a purchase until more feedback comes in so you can make a more educated decision. It’s not a good idea to play trial and error when it comes to diet pills, because they are designed to affect the body’s physiology and therefore can have side effects you’re not expecting. What do you think? Does Capsiplex work or not? At 50 bucks is not cheap at all, but if it ends up working as advertised then of course I wouldn’t say the same. The only thing is that I don’t see the evidence of this working and I think this website is saying the same thing. The only thing I can do is to try it out, but again the price is pretty high. I wonder if I should go with the fat binder instead.